"McNeil and Brown have created a new Scottish musical to celebrate ... well worth the wait." "We had a fantastic week with full houses, and without exception all reviews were great." Note: In the Pitlochry Festival Theatre productions a small cast of actor musicians was used. In the Amateur version, a pit band and a chorus have been added. It's 1943 and the curse of rationing has visited the remote Hebridean islands of Little Todday and Great Todday to the extent that the thirsty islanders have all but run out of uisge beatha - the water of life. When a cargo ship, the SS Cabinet Minister, runs aground with fifty thousand cases of whisky aboard, the islanders rush to take advantage of the unexpected bounty. But then the officious Captain Waggett, the English officer commanding the Home Guard (who sees his main duty is to control the islanders in a style reminiscent of Captain Mainwaring), learns of the illicit salvage operation – and is ordered to confiscate the liquor! The islanders are lead by the Catholic Joseph Macroon, who owns the local shop and post office, but who would like to have his fingers in even more pies. His foil is the Protestant Roderick Macrurie who owns the Snorvig Hotel and has to implement rations all round as the alcohol slowly dries up. Characters such as Willie Munro, the only Protestant on Little Todday, Jockey Stewart, and the poet Duncan Macroon ensure colour and adventure as they bring various escapades to life from the original text. 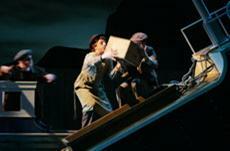 In the first act, the audience thoroughly enjoys the build up to, and the arrival of, the cargo of whisky on the stricken ship, and then the second act is devoted to the drinking of it, the hiding of it, and the disposal of it. The musical is based on Compton MacKenzie’s funny, romantic and hugely entertaining novel of the same name that was made into a memorable film in 1949. Both the film and the novel are based on the real-life 1941 shipwreck of the SS Politician near the island of Eriskay, but in the film the two islands were merged into the single island of Todday and some religious issues were left out. Working from the original novel, with permission from the Society of Authors who manage the copyright of Compton Mackenzie's works, the adaptors, Shona and Ian, have brought those two aspects of the book back to life: the different religions, and the two Todday islands - the Catholic Little Todday and the Protestant Great Todday. This aspect provides interesting light and shade to the machinations and manoeuvering that take place between the various 'warring factions'. The musical has a score that conjures up both the 1940s and the unmistakable sounds of the Western Isles, and ends with the poet Duncan Macroon and the Sergeant’s mother, Mrs Odd, toasting the beautiful islands with uisge beathe, as the sun sets. All is well in heaven and on earth and the audience is left with the feeling that they may just have caught a glimpse of the soul of the Outer Hebrides. Sergeant Major Alfred Odd - C of E, a soldier, in love with Peggy, has been away for two years fighting the war in Africa and Asia. Peggy Macroon - Catholic; daughter of Joseph Macroon, Duncan’s cousin, helps run the Post Office and shop, in love with Sergeant Odd. George Campbell - Protestant; son of Mrs Campbell who dominates him, teaches at Garryboo school, a fine tenor, in love with Catriona Macleod. Catriona Macleod - Protestant; best cook on the islands, in love with George Campbell. Mrs Campbell - Protestant; a widow, George Campbell’s mother, a dragon in the community, originally from Mull. Captain Waggett - C of E; in charge of the Home Guard on the islands, married to Dolly, no children, retired stockbroker from London. Joseph Macroon - Catholic; owner of the local Post Office and shop, Peggy’s father. Father Macalister - Catholic Priest, joins in the islanders’ adventures with great gusto. Roderick MacRurie - Protestant; landlord of the Snorvig Hotel. Duncan Macroon - Catholic; crofter, a poet, Peggy’s cousin, he finds the crock with Jockey. Jockey Stewart - Catholic; husband to Bean. Willie Munro - the only Protestant resident on Little Todday. 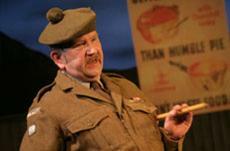 Tweed Merchant - Lieutenant Brown, Army Intelligence in disguise. (Doubles with Rev Morrison). Reverend Morrison - the Protestant minister (Doubles with Tweed Merchant). Mrs Odd - English, Sergeant Odd’s lively 70 year old mother, runs a shop in Nottingham. Bean Stewart - Catholic; wife to Jockey. Captain MacKechnie - Captain of the Island Queen. Religion not specified. (Doubles with Tom Ferguson). Tom Ferguson - the local Exciseman (Doubles with Captain MacKechnie). Captain MacPhee – Catholic; a 90 year old patriarch, likes his drink. (Triples with Corporal Ruskin and Robbie Baird). You can download straightaway a shortened copy of the script/libretto to read and get a relatively good picture of whether you would like to proceed to the next step. 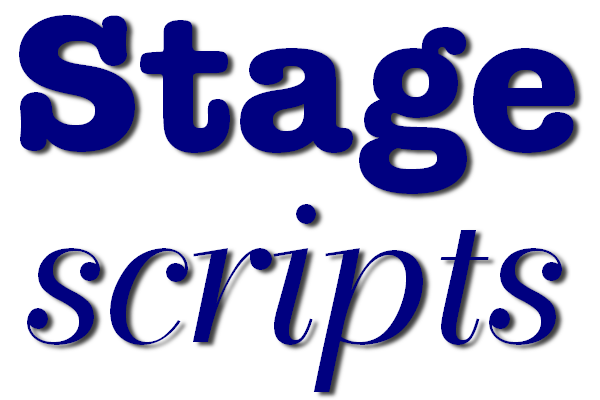 The Preview E-Script is made available to you as a pdf file sized for A4 paper and contains just over half of the script/libretto. Rehearsal Master Set on a Data CD (Cast). This contains the script and piano vocal score for your cast and crew provided as A4 pdf files. No problem about possible loss of deposit on sets of rented books, as they are yours to print out and mark up as required. The price includes a multiple copying licence allowing you to copy the Data CD itself (enabling you to give or sell copies to your cast for them to make up their own rehearsal books) or to make multiple prints of the pdf's on the Data CD for your production company to organise and provide to your cast or crew. Please note that we do not sell printed copies of libretti, nor do we hire sets of printed rehearsal libretti or scores. These are available for an 10 piece orchestra as below, for hire to production companies only, who hold a valid, unexpired, licence to perform. Regrettably we are unable to provide a licence to record 'Whisky Galore'. This is due to the strict rules imposed by Canal Plus, the current rights-holders of the 1949 film. irrespective of whether the intended use is for archival or sentimental reasons, or for training purposes.